The last six weeks have been pretty crazy for me and unfortunately I haven’t found any time to write. I said good-bye to my sister and my boyfriend at the end of August when they both moved up to BC and I agreed to spend the month of September working up in Labrador with my company. For those of you that might not know, Labrador is the beautiful, but sometimes forgotten, other half of my province. It’s a little embarrassing, but I’ve never actually been to Labrador, so I was happy to get the opportunity to visit! I spent the month living in a hotel in Happy Valley – Goose Bay and every morning I would make the hour drive up along the Churchill River to the Muskrat Falls construction site for the Lower Churchill Project. I’ve never worked on a construction site before, so I definitely appreciated the work experience. When I arrived, we would cross the river every morning just as the sun would start to rise over the river, and by the time I left, I was enjoying the beautiful fall colours as the leaves on the trees started to change. I’m back to my job in St. John’s now, but I had a week off before going back to work, so I decided to make a quick trip up to Vancouver to visit Emily and Seth. Seth and I spent the week hanging out in Vancouver and on the weekend, Emily came in to visit us from Victoria. The weather wasn’t great during the first few days, but we tried to make the best of it! We spent a day visiting Stanley Park, which is a huge park located on a peninsula roughly the size of downtown Vancouver. The size of it looks a bit daunting on a map, so we were going to rent bikes to explore the park, but we decided there was no rush to see everything and instead chose to explore by foot. It was definitely the right choice and we ended up covering a lot of ground anyway. I love Stanley Park because even though it’s right in the middle of the city, you can feel like you’ve completely left it behind while you’re there. We spent the afternoon walking through the woods, admiring the lush green colours and the tall trees. Seth’s always on the lookout for birds and we even managed to spot a blue heron and a woodpecker while we were there. We walked up to the far end of the park to Prospect Point, which has a beautiful view of the harbour, North Vancouver, and the Lion’s Gate Bridge. 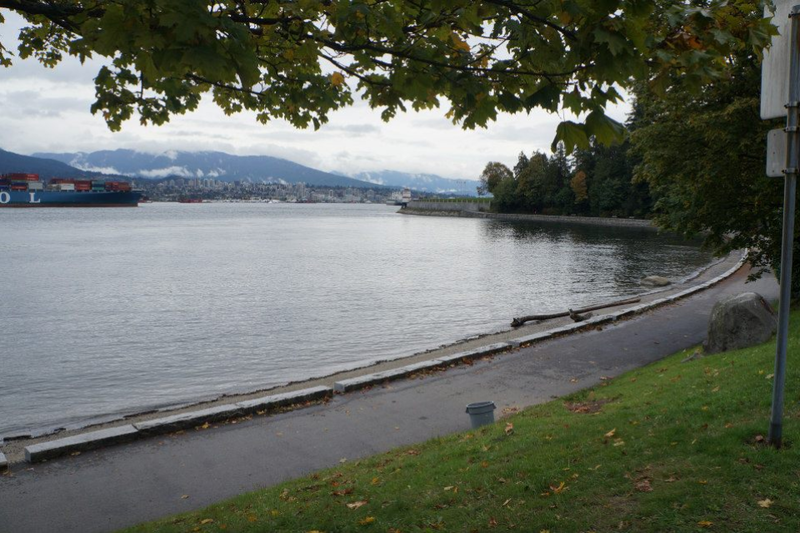 We rounded off the afternoon by walking back the length of the park along the old seawall by the harbour. Since Vancouver is known for it’s sushi, we made sure to stop into a small sushi place near Seth’s apartment in Burnaby. It ended up being some of the best and cheapest sushi I’ve ever had! We managed to have a small feast (with enough leftovers for another meal for both of us) for the low price of $25! We spent another evening exploring Granville Island; I love the shopping on Granville Island, everything is pretty artsy and interesting and there’s tons of fair trade and organic products to be found. It also has some delicious seafood to try, albeit, the food is a little more on the expensive side. 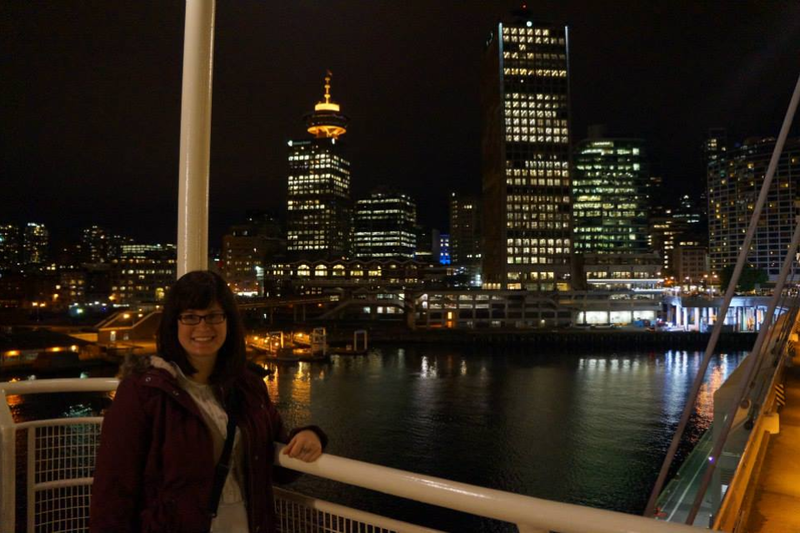 I’ve never stayed in a hostel in Canada before, but when Emily came for the weekend, we found one in downtown Vancouver to try out. The selection of hostels to choose from was definitely way smaller and more pricey than the cities I visited in Europe. The backpacking community is definitely way different in North America and I found the hostel atmosphere and the value for money wasn’t as good. 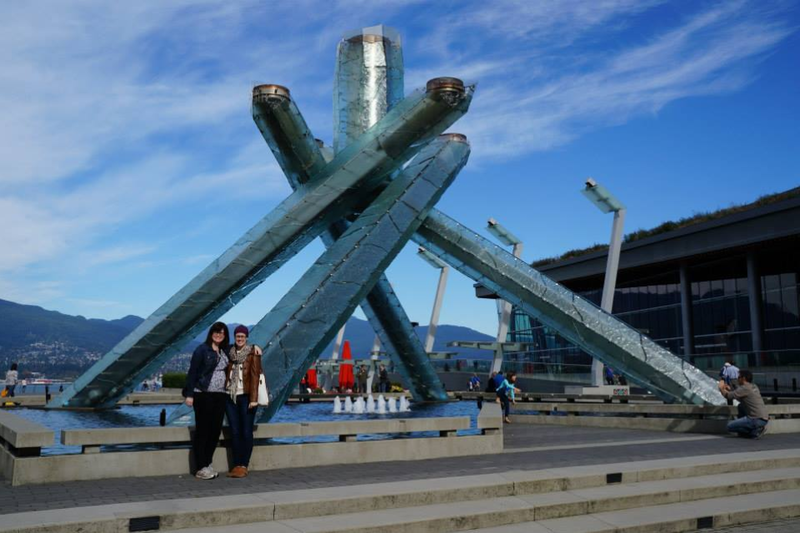 That said, Vancouver probably has more hostels than any other Canadian city, so at least we had a few to pick from! To start off the weekend, we met up with a few of my friends living in the area on Saturday morning and we all went hiking up in North Vancouver! 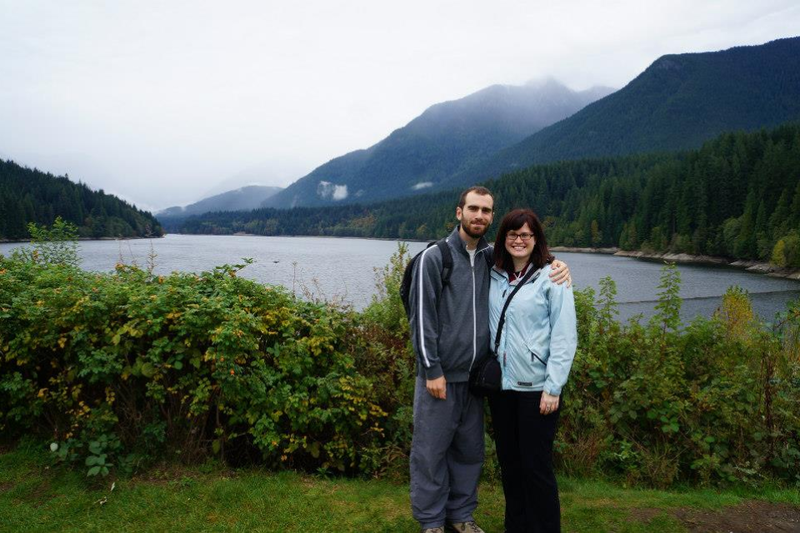 The trail was called the Capilano Pacific Trail and it starts at the harbour and follows a river up through the woods to a dam and reservoir. 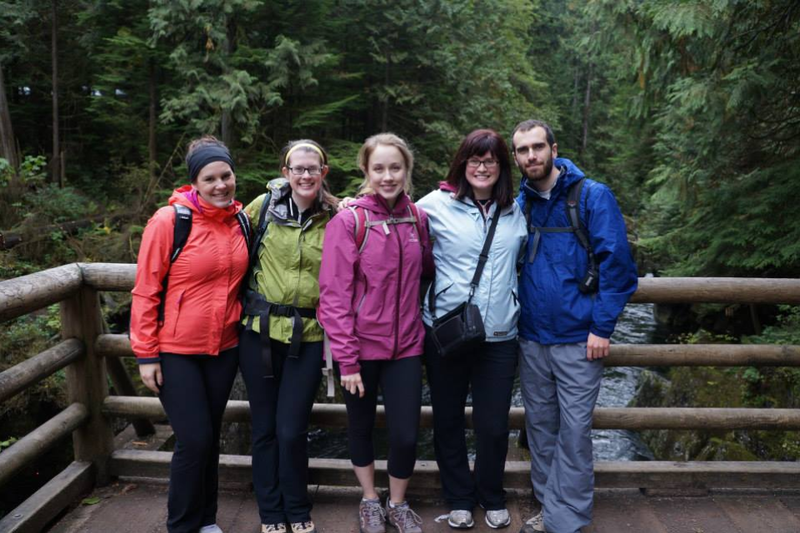 Luckily, the weather cleared up for the weekend and we had a great time hiking up through the woods. We ate our picnic lunch at the top of the dam and had a gorgeous view of the mountains around the reservoir lake and the canyon on the other side of the dam. The hike ended up not taking as long as we thought it would, so we spent some time enjoying gelato at Kitslano beach in the late afternoon and had supper at a delicious vegetarian restaurant called The Nom. We only asked two people to recommend restaurants, and they both suggested The Nom, so we felt we had to try it out. They had a pretty varied menu, but it was fun trying out some new things. Sunday was my last day in Vancouver, so me, Emily, and Seth all went back to Stanley Park to go to the Vancouver Aquarium. Beluga whales have been my favourite animal since I was little, so I was really excited to see them. They had a beluga show right when we arrived, so we made sure to check that out first. The aquarium had tons of other cool animals as well: dolphins, penguins, seals, sea lions, otters, etc. I’ve seen most of the animals before, but what I liked about the aquarium was that the animals were all rescue animals. The aquarium is a non-profit organization that rehabilitates rescued animals using the money they make off entrance fees. It’s a great way to support the animals and educate people at the same time. Throughout the day, they have tons of short shows called “spotlight on otters” or “spotlight on seals” where they just take 15 minutes to teach you about each animal. With the exception of the dolphins, it wasn’t about making the animals do tricks or shows, but about highlighting interesting things about them while just watching them eat and swim around. Parks like Sea World have been criticized for their animal training and shows; I liked that the Vancouver Aquarium was a non-profit and that their number one priority was the animals, not making a profit. Overall, it was a great week off, but I am happy to finally be back home after almost 6 weeks away. I’m back to working a regular work week, so I’d love to catch up with friends in the evenings and on weekends!